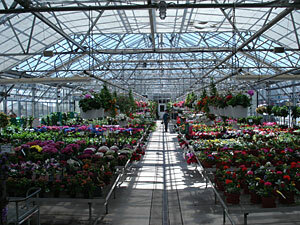 Come look and visit our 8,000 square feet of greenhouse and garden center. Large varities of bedding plants, perennials, mulch, potting soil and more. We grow our own plants with tender loving care. Choose from a variety of plants and flowers for all your bedding and ornamental garden needs. Visit us during every season, where you can see the beauty of nature evolving around you. A variety of bright blooms fills our newest greenhouse, shown here in the top photo. Shown below is a view of our lush green plants. Our greenhouses are always filled with something new and beautiful for every season! Visit our locations, click here for directions.